HCFoo's Tennis Blog – Tennis Celebrity Photos, News, Gossip and More! : Win a tennis ball signed by Andy Murray! Win a tennis ball signed by Andy Murray! 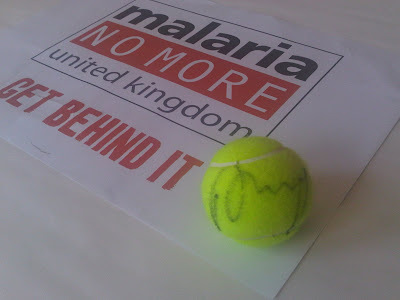 To mark the start of Wimbledon, we have teamed up with new charity Malaria No More UK to give away a tennis ball signed by top British tennis star Andy Murray! Murray is a big supporter of Malaria No More UK, a groundbreaking new charity committed to ending suffering and death caused by malaria. Despite being a wholly preventable and treatable disease malaria still claims close to one million lives every year. Malaria No More UK is committed to ending this and you can be a part of it. A £5 donation will buy and deliver a life saving mosquito net to protect a mother and her child in Africa. To find out more about malaria, Andy's support and to donate please visit www.malarianomore.org.uk. To win our special ball, signed by Murray, please answer the following question. Question: Besides Andy Murray, name another sportsman who is also a member of the leadership council of Malaria No More UK. Please e-mail your answer to hcfoo7@gmail.com before Monday, 29th June. Entries received after the stipulated time will be disqualified and ineligible for consideration for prize. The winner will be announced by the Organiser via e-mail and will be posted on this blog. The prize will be sent to the winner by Malaria No More UK via Royal Mail. By entering the competition you consent to receiving Malaria No More UK's newsletter. They won’t inundate you with junk mail – they’ll only send you information when it’s useful.